Come Lunar New Year, every restaurant seems ready to outwit, outplay, out last all others with interesting (and sometimes strange) takes on Lo Hei and Peng Cai. 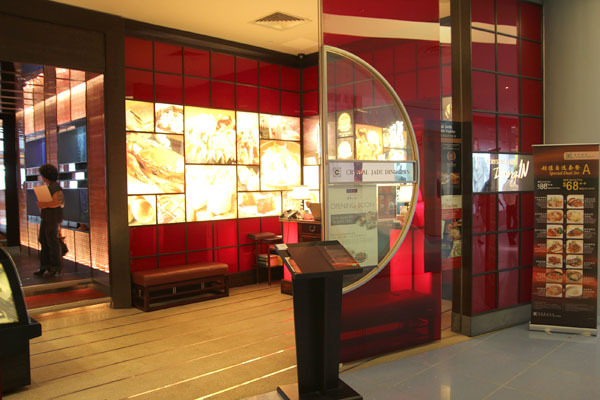 For this 2012 Chinese New Year menu, Crystal Jade seems all set to impress with their innovation of the Pagoda of Eight Treasures, a Chinese take on the traditional Indonesian dish Nasi Tumpeng. The $88.80 dish came out like an impressive masterpiece of art, so much so that my table was ‘wowing’ non-stop at the creation, hands whipping out their camera to take hot shots of this festive dish. 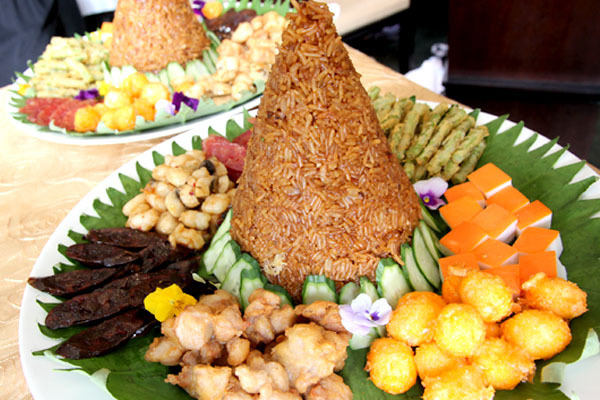 The centerpiece of a large cone made of fried glutinous rice with conpoy and mushroom is marvel-worthy. We are all kind of worried it would topple, but it didn’t. Great dish for superstitious Chinese – you can shout your ‘bu bu gao shen’ (climb higher) with this tower of rice looking like a majestic dragon. 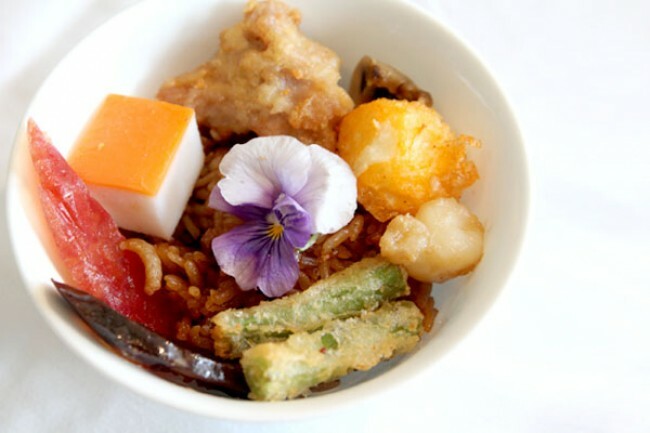 The other seven treasures include preserved sausage, sautéed shrimps, octopus, chicken, French beans, quail egg and mushroom. I specially loved the fragrant well-fried rice, which is a luxurious combination with the lap cheong, the entire thing tasting somewhat like a more delicate bak chang. 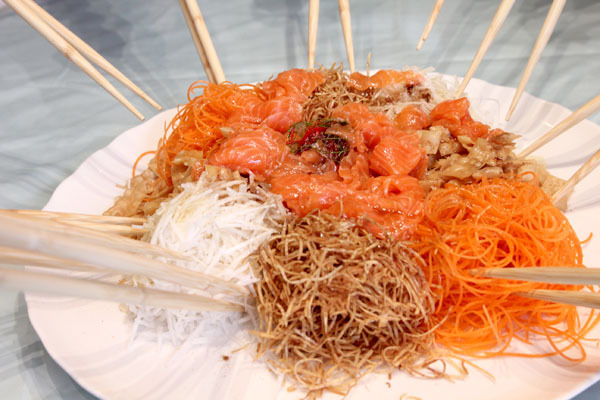 The Golden Yu Sheng of a steep price tag of $88.80 too (prosperity! ), served with thick fresh slices of salmon. 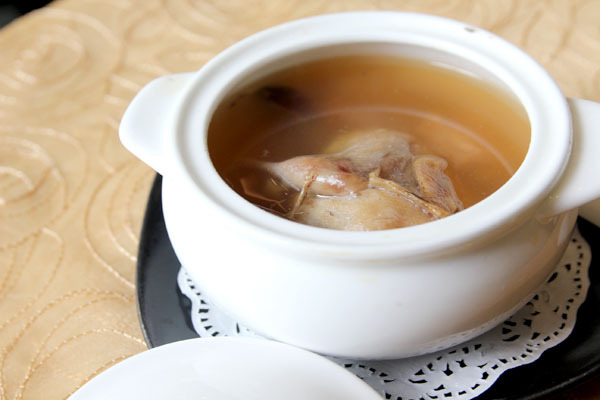 This version has a sweeter sauce, best for those who want to start the year feeling romantic ‘tian tian mi mi’. 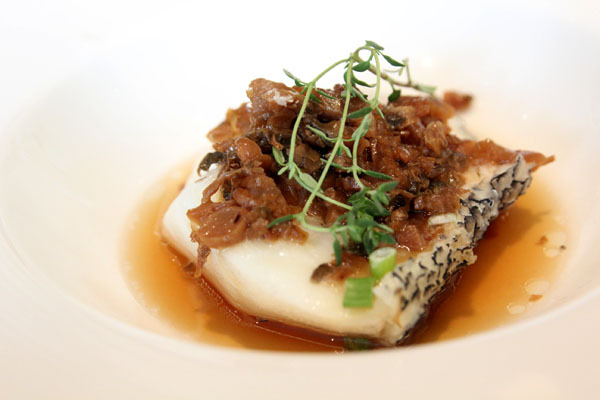 Of all the dishes I tried such as the Braised Dou-miao with Assorted Dried Seafood ($12) and Double-boiled Quail soup with Chinese herbs ($22), the one I savoured most was surprisingly a simple Steamed Sea Bass with Preserved Vegetables ($12). The thick-sliced fish meat was simple yet fresh, with the chai poh adding a tinge of saltiness that breathes home-cooked goodness.